Vijay Bhasker Yetapu is founder and president of a true non-profit organisation “VChangeU”. His area of expertise is to promote longevity of life through innovative and creative approaches. His research addresses motivational processes involved in healthy living across the life span. Having over 19 years of critical thinking experience in a consulting, management, corporate role in IT and over 9 years in non-profit leadership. He has received several national and international scholarships for his work on health which includes 2 times scholarship awardee for 15th and 16th “World Conference on Tobacco or Health”, “International Conference on Public Health Priorities in the 21st Century: The Endgame for Tobacco!”. His paper “A good sleep makes you younger by the day” was selected to present in “3rd International Sleep and Breathing Conference” held at Barcelona, Spain in April, 2015. His paper “Tobacco free companies - a corporate social responsibility approach” selected for “17th World Conference on Tobacco or Health” held in Cape Town, South Africa from 7th to 9th Mar-2018. His paper “FOOD FOR HEALTH AND SUSTAINABLE LIVING” has been selected for Oral presentation at International Conference on Nutritional Science and Food Technology under the "Track 11: Food Safety and Security Challenges" held in Rome, Italy on 02nd & 3rd July 2018. On a personal note, his passions include social work, photo posing, technology, dancing, traveling, good food and the creative arts. I explored many physical activities and found walking as one of the most popular form of daily exercise I could adopt for my optimal health. Its been over 8 years I started doing brisk walking and its became my way of life. I start my day by walking 5Kms as a single stretch and 4Kms during rest of the day by walking in break time and by taking steps instead of lift. My total investment from past 8 years for walking is ₹4500 [$70] for my first shoes. 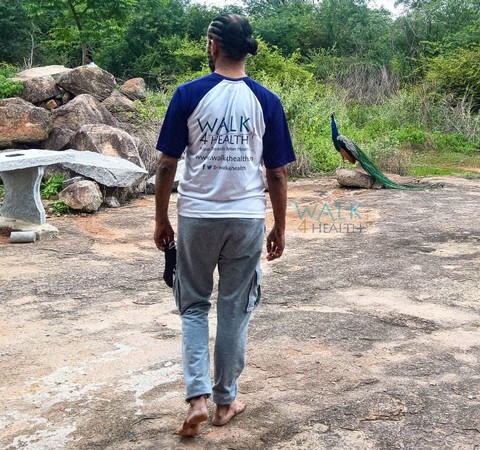 From past 4 years I started walking barefoot, I enjoy walking barefoot without any difficulty. Note: Explore the walking track before trying the barefoot walk. Going for a walk around your local park offers several things that can give your mood a boost. Listen to the sounds of the birds, nature offers an orchestra of sounds and visuals, you will spot a variety of butterflies, dozens of shades of green, fresh air, early sun shine, step out and walk in park you will fall in love with the nature. Walking increases the grey matter in our brain, leading to great thinking. All the bunch of ideas from past few years came to me while walking. Walking for 40 minutes each day is one of the best things you can do for your body, mind and for protecting overall health. If you walk more, you improve your chances of a longer and healthier life. I tried to explore the stress level of mine for one of my study by giving up the job and sustained for 3 years in a row, walking has kept me healthy through even the most stressful periods. If you enjoy the great outdoors, there is no better way to reconnect with nature when you walk around park or any other places. Walking is one of the first thing we learn and experience of being human when we are as young as one year. Walking enhances your health, one step at a time. What are you waiting for, step out and enjoy your walk!